A small but very interesting fishery holding a wide variety of species. 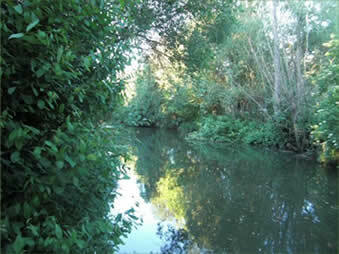 Joined by the River Colne to Broad Colney Lakes this water offers a variety of different pegs. You will find Roach, Perch, Bream, Carp, Crucian Carp, Tench, Pike and a large contingent of roving Chub who move down from the river Colne. A wide variety of methods work on this very diverse fishery. For good Bream sport try fishing the waggler to the islands, using caster or maggot over ground bait. Sweet corn or worm in the margins can find the big Tench. Try Pole fished caster on the river pegs tight against the far bank cover for Chub. Cracking roach sport on hemp and caster from pegs 25-30 and 3-6. Good Carp can be found just about anywhere try pegs 1-6 in the summer. Chopped worm will produce Perch all year round with the odd bonus Crucian or Tench a distinct possibility. The Club has received complaints from the residents of Lowbell lane of members parking in the lane, this is not allowed. 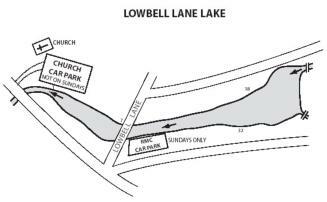 During the week we share the Church car park and at weekends we make use of the Lafarge (Redlands car park) see your Guide to Fisheries Map Book.